Access the map portal to generate a report using the best available flood data for the region. 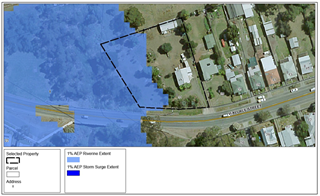 The data provided in this tool has been developed to help communicate the risks of flooding in the Corangamite Region. The data is not provided as professional advice, and should not be relied upon for site specific decision making or for making financial or any other commitments. While every effort has been made to ensure the accuracy and correctness of materials presented, the developers make no expressed or implied warranties (including warranties of merchantability and fitness) with respect to the accuracy, completeness, character, function, or capabilities of the tool and the data and images accessed through it. Appropriate use and conclusions drawn from the data and images are the responsibility of the user. The developers expressly disclaims liability for any loss, however caused and whether due to negligence or otherwise, arising directly or indirectly from the use of, or reliance on, this tool or the information contained in it, by any person.